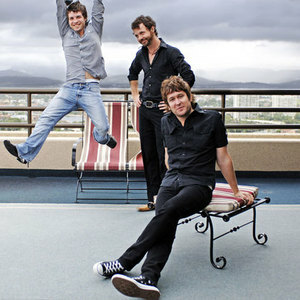 Eskimo Joe is alt-rock band from Fremantle, Western Australia comprising Kavyen Temperley (bass/vocals), Joel Quartermain (guitar/drums) and Stuart MacLeod (guitar) The group initally formed to compete in the National Campus Band Competition in 1997. Temperley and Quartermain were already in a band at the time, Freud's Pillow, but had met with little success and asked Temperley's childhood friend MacLeod to form a new band, which became Eskimo Joe. The band ended up winning the competition prize: a slot at the 1997 Livid Festival and a session in a studio to record their first EP, Sweater. The title track became so successful on national broadcaster Triple J, it gained much airplay and featured in the Hottest 100 of 1998. A second EP Eskimo Joe followed up in 1999. Later in 1999, Eskimo Joe was signed on to Modular and in 2001, their debut album Girl, which went gold. After splitting with Modular, they signed a new contract with Mushroom in 2002, releasing sophomore album A Song Is a City in 2004. The album went double-platinum and earned the group Best Artist the following year. Settling down for six weeks over Christmas in 2005, the noticeably darker album Black Fingernails Red Wine, was recorded and released the following June, debuting at number one on the ARIA charts and later going platinum. The band (jokingly) described the album as their "stadium rock" record and headed out on extensive touring around the country, including a stint at Live Earth in Sydney. The band eventually went on to tour the globe, with trips around the US and Europe, before recording their fourth album, Inshalla, in Byron Bay. The album was released in May 2009 and topped the charts at number one in the ARIA album charts. It explores a very different sound for Eskimo Joe, with lead singer Temperley saying the band were a stage where they wanted to do something different musically and also in their personal lives.